Noble Rich Pan PVC Shower Pan Liner (5 ft. Wide), per Linear Ft. The Noble Rich Pan is a waterproof PVC membrane designed to be used under full mortar bed shower pan installations. 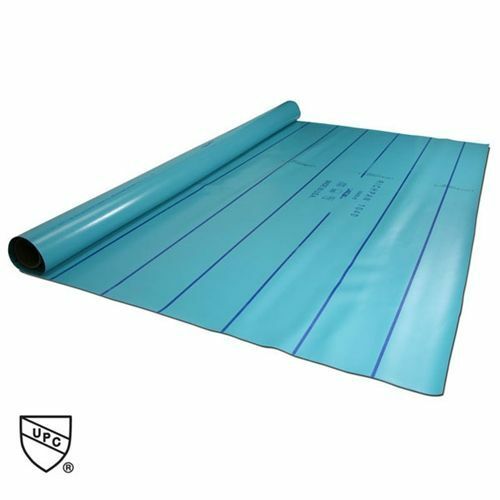 The membrane is 5 ft. wide (.040" thick) and cut to desired length. Sold by the linear foot. For example, if you wanted a 5' X 6' piece, your quantity would be 6. If you wanted a 5' X 50' piece (full roll), your quantity would be 50. RichPan 1040 is a flexible polyvinyl chloride (PVC) membrane used under full mortar bed installations for concealed waterproofing. This sheet may be installed by a thin-bed method directly on properly prepared substrates per industry guidelines. RichPan meets requirements of the IAPMO #3577. Do not use with direct thin-set tile method. Noble Company recommends using NobleSeal TS for thin-set applications. Tile cannot be directly bonded to RichPan. A reinforced mortar bed is generally laid over RichPan. Tile can then be thin-set to the mortar bed. You're reviewing:Noble Rich Pan PVC Shower Pan Liner (5 ft. Wide), per Linear Ft.